With regret we inform you of the death of William F. (Billy) Roe K.C.S.G., Tinkers Hill, Ballinderry, Mullingar (ex- ESB) Dec. 7 2018 (peacefully) in the tender care of the staff and nurses of Cluain Lir Nursing Centre, Mullingar. Loving husband of Bette and adored father of Willo, Lisa, Mark, Stephen, Tiernan and Elva. He will be deeply missed by his wife, sons, daughters, beloved grandchildren, son-in-law, daughters-in-law, brother-in-law, nephews, nieces, relatives and wide circle of friends. Reposing at Shaw’s Funeral Home, Mullingar on Sunday, Dec. 9. 2018, from 2.30 o’c until 4.30 o’c with removal thereafter to The Cathedral of Christ the King arriving at 5 o’c. Funeral Mass on Monday at 10 o’c followed by burial in Ballyglass Cemetery. House private please. away, peacefully, on 31st August, 2018, at home in Cabinteely, Co.
U.S.A., along with his many friends. by burial in Kilternan Cemetery Park, Ballycorus Road, Kilternan. With regret we inform you of the death of our colleague Norma Ludden, Clonminham Rd., Portlaoise. Norma passed away on 26th July. Reposing at Keegan’s Funeral Home, Portlaoise on Thursday evening 2nd August from 7 pm with rosary at 8 pm. Removal on Friday morning to SS Peter and Paul’s Church, for 10 am Requiem Mass. Interment will follow afterwards in SS Peter and Paul’s Church Cemetry Portlaoise. 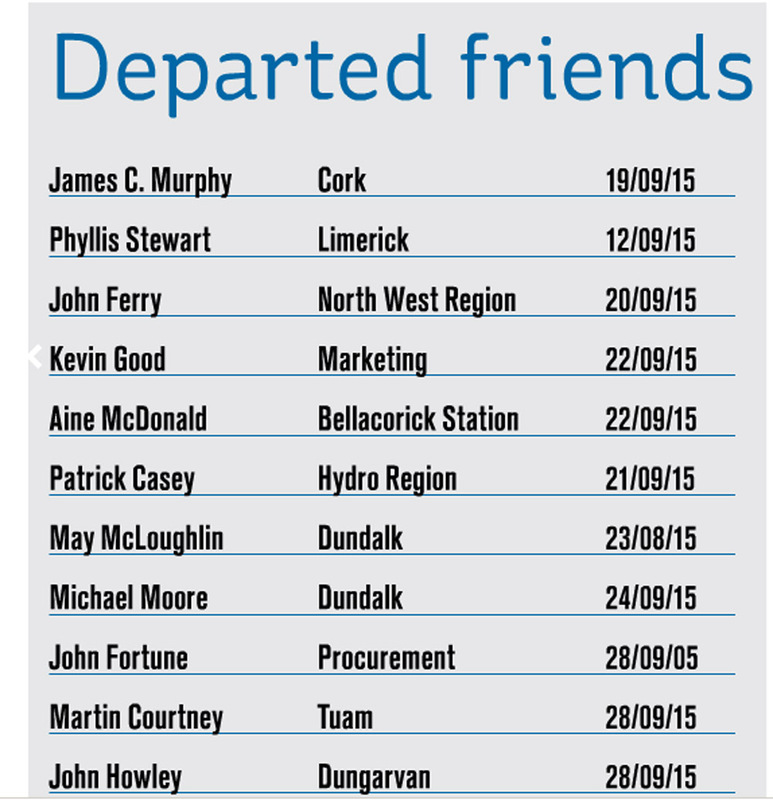 With regret we inform you of the death of our colleague Michael McCarrick on Friday 4th. May, 2018. Reposing at Mc Gowan`s Funeral Home, Ballina on Monday evening from 6.30pm until 8.30pm. Funeral will arrive to St. Muredach`s Cathedral, Ballina on Tuesday morning for funeral mass at 12.30pm with funeral proceeding to Lakelands Crematorium, Cavan. With regret we inform you that the death has occurred of Martin Farrell On 31st October 2017, ex ESB Transmission Dept. Peacefully at his residence surrounded by his loving family. Predeceased by his beloved partner Anne Lilly; sadly missed by his loving mother Frances, sisters Rita, Ann & Pauline, his nephews, niece, extended family and a wide circle of friends. Reposing at his residence at Mullylusty, Belcoo, Co.Fermanagh on Wednesday from 4pm to 9pm. House private at all other times. Funeral Mass on Thursday in St Patrick’s Church, Holywell, Belcoo, Co. Fermanagh at 12 noon followed by burial in the adjoining cemetery. 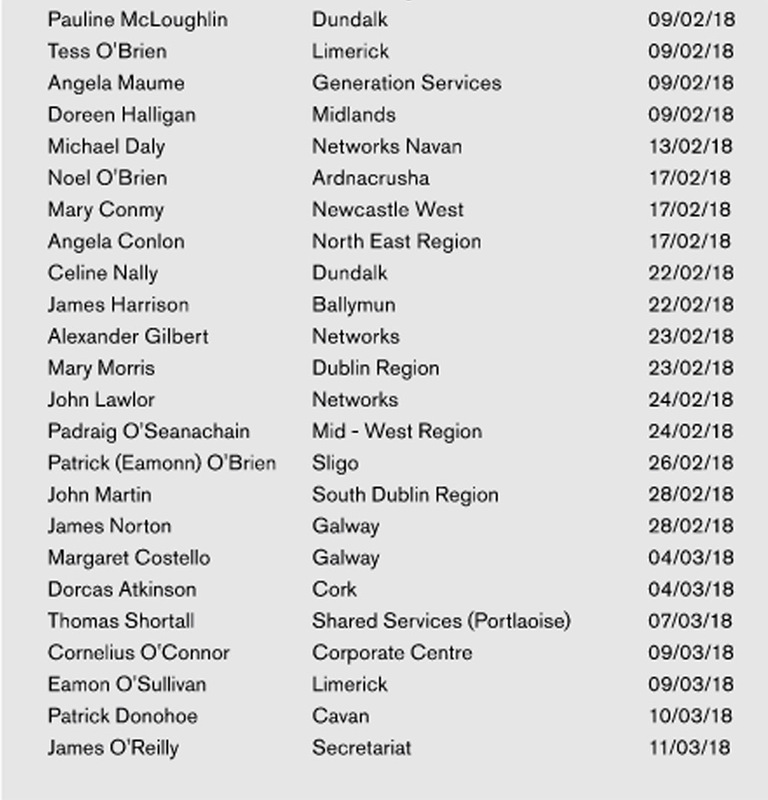 No flowers by request, donations in lieu if desired to Meath Hospice Palliative Care c/o any family member or Conway Funeral Directors, Belcoo, Co. Fermanagh. CLARKE (Dublin) – Aug. 18, 2017 (peacefully), at Our Lady’s Hospice, Harold’s Cross, Desmond (Who Says) (late of Mountain Park, Tallaght and formerly of Gray Street), beloved husband of Marie and loving father of Karla and Joanna; sadly missed by his loving family, sisters Betty and Carmel, brother Michael, sons-in-law, grandchildren, brothers-in-law, sisters-in-law, nephews, nieces relatives and a large circle of friends. With regret we inform you of the death of Bobby Griffith, retired staff and formerly of ESB Portlaoise staff. Reposing at Droimin nursing Home, Stradbally this Monday evening 14th August 2017 with prayers at 8:00pm. Service in St. Peter’s Church, Portlaoise at 3:00pm tomorrow. Interment afterwards in the adjoining cemetery. COLEMAN (Greystones, Co. Wicklow and formerly of Bandon, Co. Cork) – July 7th 2017 (peacefully) at St. Vincent’s University Hospital: Oliver; dearly beloved husband and best friend of Anna. Sadly missed by his loving wife, sisters-in-law Marian and Phil, nephews Liam and Francis, nieces Margaret and Elaine, grandnephews, grandnieces, relatives and friends. Rest In Peace. Reposing at his home on Sunday evening from 4pm with a gathering of family and friends for 6pm prayer service (All Welcome). Removal on Monday morning to the Church of Our Lady Queen of Peace, Putland Road, Bray arriving at 10 20am. Funeral immediately after 10 30 o’clock requiem mass to Mount Jerome Crematorium, Harold’s Cross, Dublin 6W. No flowers please. 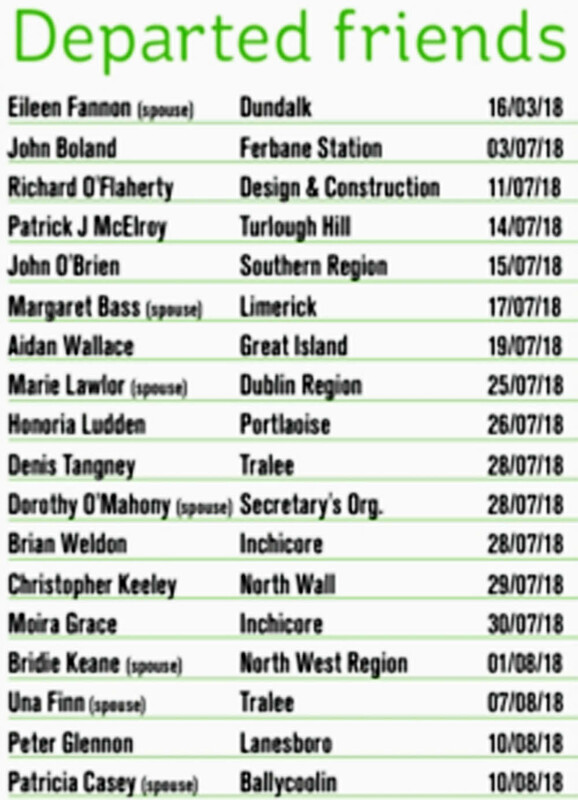 Donations if desired to Irish Kidney Association. Donation box at rear of Church. 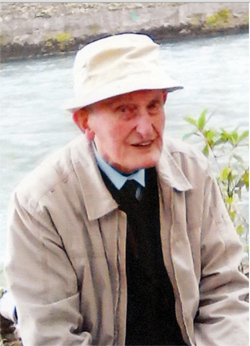 With regret we inform you of the death of Tom Connolly, Green Road, Portlaoise. Retired ESB Portlaoise. Reposing at the Chapel of Rest, Portlaoise today Monday from 6:00pm with Rosary recital at 8:00pm. Removal tomorrow Tuesday 7th February 2017 at 9:15am to arrive at SS Peter & Paul’s Church for 10:00am Requiem Mass. Interment afterwards in SS Peter & Paul’s Cemetery. 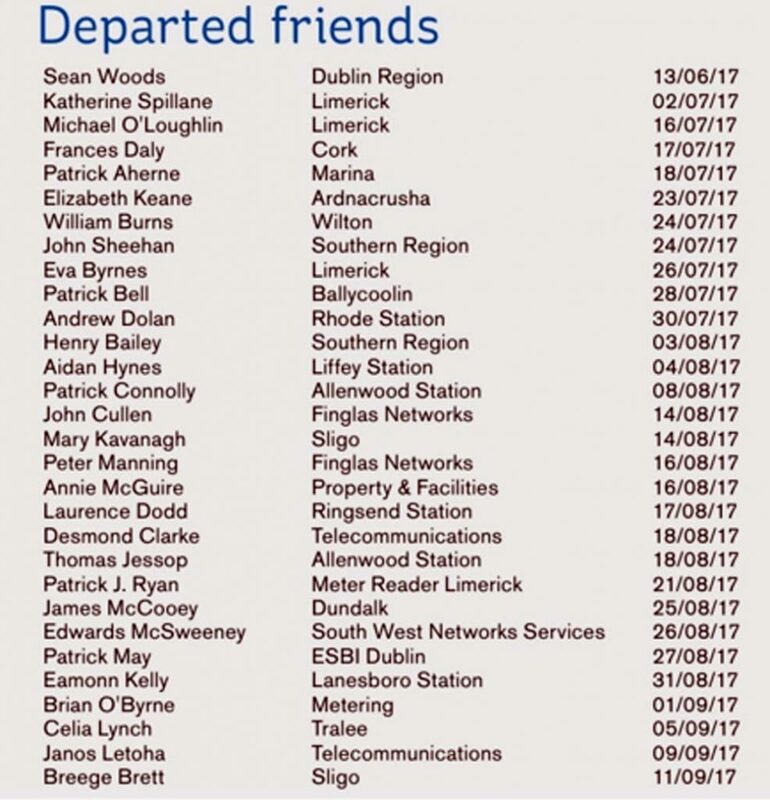 With regret we inform you of the death of James (Jimmy) Bissett, (Coolock), 30th January 2017, formerly of ESB Poolbeg. Reposing in Jennings Funeral Home, Oscar Traynor Road, Coolock on Tuesday, with family in attendance from 4.30pm to 6.30pm. Removal to St. Joseph’s Church, Bonnybrook on Wednesday for 10.30am Funeral Mass, followed by burial in Fingal Cemetery. Family flowers only, donations, if desired, to St. Francis Hospice. Hill, Michael (late of Sandycove, Co Dublin & ESB) Jan 9th 2017 (Peacefully) in the loving care of St Michael’s Hospital & Carysfort Nursing Home. Beloved husband of Winnie and much loved father of Damien, Denise, Felicity (Kenny) & Catherine (Roche). Sadly missed by his loving family, sisters Annette and Carrie, sons-in-law Peter, Paul and Conor, grandchildren, nieces and nephews. Reposing Wednesday in Quinn’s of Glasthule, from 5pm to 7pm. Funeral Mass on Thursday in St Joseph’s Church, Glasthule arriving at 10am followed by burial in Deans Grange Cemetery. House private. Family flowers only. Peacefully, after a short illness in the loving care of all at Mullingar General Hospital. Beloved husband of the late Nuala Dennehy (née Finnegan) and dear father of Irene, Peter, Ian and Evan. Very sadly missed by his daughters-in-law Bernie, Andrea and Gráinne, grandchildren, Tom, Jill, Fionnuala, Alison, Laura, Eoin and Niamh, his brother Denis, sisters Máire and Anna, sisters-in–law Damhnait and Peggy and brother-in–law Richard, nieces and nephews, relatives, neighbours and friends. Burial took place on December 4th in Forgney Cemetery. (And formerly of Belville, Monivea).Peacefully at the Galway Clinic surrounded by his loving family. Deeply regretted by his loving wife Margaret (nee Lawless), daughters Mary and Siobhan, sons Michael, Joe and Oliver, son in-law John, daughters in-law Theresa and Shirley, grandchildren Mary Agnes, Joe, Megan, Derek, Daniel, Erin, Mikey, Stephanie and Ian, brothers Mickie, Mattie, Frank, Pat, sisters Mary, Patsy, Kathleen, Alice and Bridget, brothers in-law, sisters in-law, nieces and nephews, extended family and friends. Reposing at Quinn’s Funeral Home, Athenry on Friday evening from 5pm to 8pm. Requiem Mass on Saturday at 2pm in the Church of the Immaculate Conception, Newcastle. Burial afterwards in the New Cemetery Athenry. House strictly private on Saturday morning. No flowers by request donations if desired to The Poor Clare’s. With regret we inform you of the death of Jimmy Nugent, Monkstown, Monilea, Mullingar, Co. Westmeath, November 29th, suddenly at the Midlands Regional Hospital Mullingar, late of ESB Transmission Dept. and ESBI. Deeply regretted by his sisters Ena Clinton (Mullingar), Phyllis Fitzsimons (Monkstown) and Maura Carty (Drumcree), brothers- in- law Eddie, Michael, and Peter, nephews, nieces, grandnephews, grandnieces, cousins, neighbours and a large circle of friends. Reposing at St. Camillus Nursing Centre Chapel Killucan on Thursday December 1st from 3.30pm followed by Mass at 5.30pm with removal to the Church of the Assumption Taughmon to arrive at 7 pm. Funeral Mass on Friday December 2nd at 11am. Burial afterwards in adjoining cemetery. With regret we inform you of the death of Aidan Barry, Chapel St., Ballyroan, Co Laois and formerly of ESB Training Centre, Portlaoise. Reposing at the Chapel of Rest, Midlands Regional Hospital, Portlaoise from 6:30pm Wednesday, 2nd November, followed by Rosary at 8:00 pm. Removal (from Chapel of Rest) on Thursday morning at 10:30 am to St. Patrick’s Church, Ballyroan for Requiem Mass at 11:00 am. Burial afterwards in St. Patrick’s Cemetery. Family flowers only. 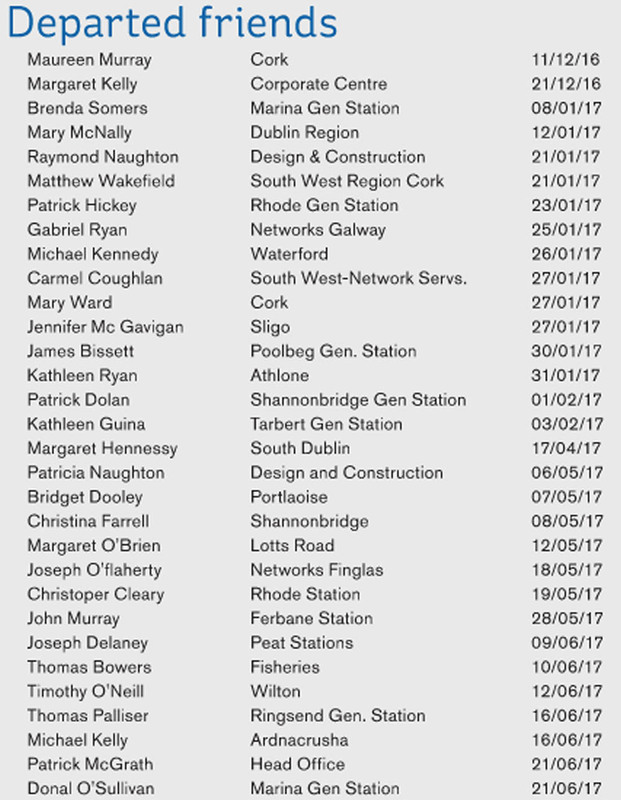 Donations in lieu to Irish Cancer Society. 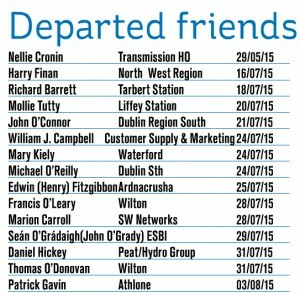 With regret we inform you of the death of Leslie Dungan, late of ESB Transmission Dept. and ESBI Stephen Court, on Saturday 29th. October 2016. With regret we inform you of the death of Edward (Eddie) Eaton, late of ESB Transmission Dept. and ESBI Stephen Court, on Friday 28th. October 2016. Edward (Eddie) Eaton, 28th October 2016, Templeogue Dublin 6.W, Peacefully, after a short illness, surrounded by his loving family in the wonderful care of the staff of Our Lady’s Hospice, Harold’s Cross. He will be sadly missed by his beloved wife Geraldine, daughter Maura, sons Eamonn, Colm, Kieran and Gerard, daughters-in-law, grandchildren, sisters Margaret and Lily, his brother John, relatives and his many friends. With regret we inform you of the death of John Fitzgibbon, Cullenagh, Portlaoise, Co Laois and formerly of ESB Portlaoise. Reposing at his home from 10am on Wednesday 19th October with recital of the Rosary at 9:30pm. 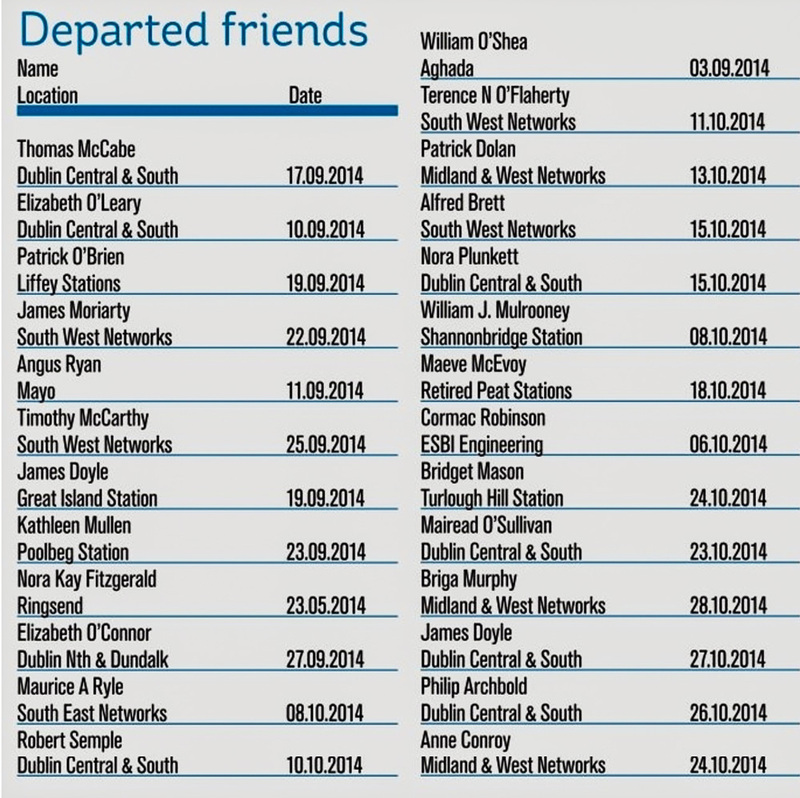 Funeral arriving for 12 noon Requiem Mass on Thursday 20th October to St Patrick’s Church, Ballyroan. Burial after in St Patrick’s Cemetery. House private on Thursday morning. Family flowers only. Corbett William (Billy) (Artane, Dublin, formerly of Phibsboro and late of the E.S.B) October 2nd 2016 (suddenly) at home; beloved husband of the late Carmel and much loved and cherished dad of Sandra, Declan and Alan. Very sadly missed by his family, Monica, Olive and Hugh, his adored grandchildren Sarah, Michelle and David, brother Jack, nieces, nephews, extended family, friends and neighbours. Reposing in Lanigan’s Funeral Home, 21 Beaumont Road on Wednesday evening from 4 pm to 6 pm. Removal on Thursday morning to St. Brendan’s Church, Coolock, arriving at 9.50 am for Mass at 10 am. Funeral afterwards to Glasnevin Crematorium. Family flowers only please. Donations, if desired, to St. Francis Hospice, Raheny. 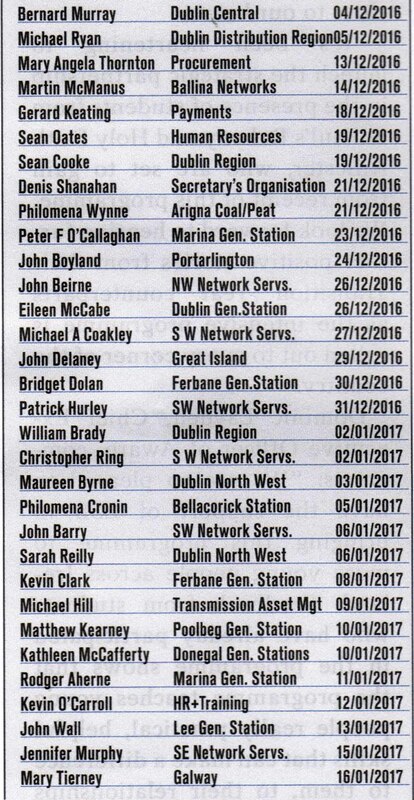 With regret we inform you of the death of Fintan Maher on Friday 9th September, 2016, ex ESB formerly of the commissioning/relay testing group in PowerGen. Reposing at his home in Templeogue on Saturday from 5 pm with Rosary at 8 pm. Requiem Mass in St John’s Church Killenard, Portarlington on Sunday at 12:30 pm. Interment afterwards in the adjoining Cemetery. Family flowers only please. Donations if desired to Our Lady’s Hospice, Harold’s Cross. Bellaney, Oldcastle, Meath / Drumshanbo, Leitrim. 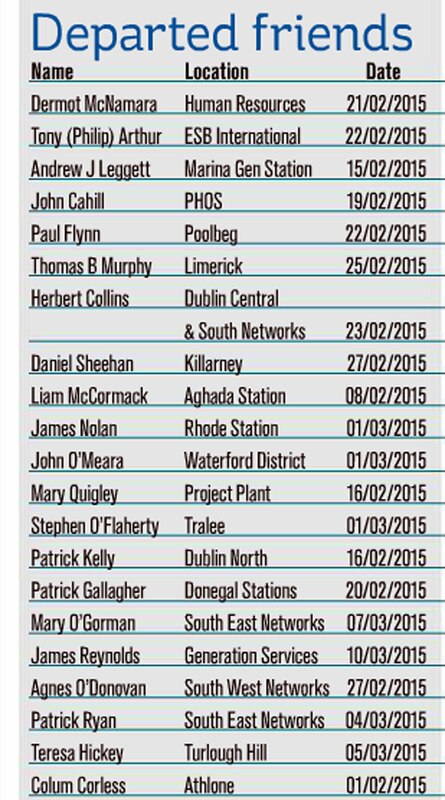 Brendan worked in ESB Powergen Arigna and Lanesboro Power Stations. Brendan Farrelly, Bellaney, Oldcastle, Co. Meath and Drumshanbo, Co. Leitrim. (ESB). 20th August 2016. Deeply regretted by his loving family. Brothers Harry, Oliver, John Joe, Danny, Ger and Bernard, sisters-in-law, aunts, nieces, nephews, relatives and a wide circle of friends. Reposing at Gibneys Funeral Home, Oldcastle from 2pm till 9pm Tuesday 23rd of August. 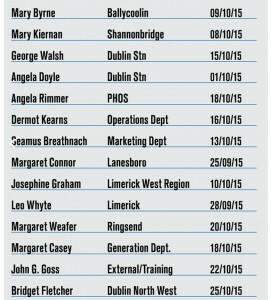 Funeral Mass Wednesday at 11am in St Marys Church, Moylagh with burial afterwards in adjoining cemetery. With regret we inform you of the death of Seamus Conneely ex ESB Galway. Formerly of Knockbane, Moycullen, Co. Galway, peacefully in the tender and loving care of the staff of University Hospital Galway, surrounded by his family. Beloved husband of the late Breed and loving brother of the late Gerry, father of Maura, Patricia and Evelyn. Deeply mourned by his loving family, sisters Kitty, Nora Mai and Ena, sons-in-law Seán, David and Donal, grandchildren Alison, Steven, Ronan and Éimear, extended family and a wide circle of friends. Reposing at St Anthony’s Room within the Church of St John the Apostle, Knocknacarra, Galway on Tuesday 9th August from 5pm with removal to the Church at 7pm. Funeral Mass on Wednesday 10th August at 12 noon followed by burial in Rahoon Cemetery. House private. Reposing at McGing’s Funeral Home, Westport on Tuesday evening 2nd August from 6 o’clock with removal at 7.30 to St. Mary’s Church, Westport. Requem Mass on Wednesday at 12.30 with the funeral proceeding to Aughavale Cemetery. RIP. With regret we inform you that the death has occurred of Frank Nolan former EO Carrick-on-Shannon Co Leitrim. Funeral arrangements as follows reposing at his home today and tomorrow 5pm to 9pm both days. Removal to St Michaels Church Drumlion on Thursday for mass at 12.30 followed by burial in Ardcarne cemetery. May he rest in peace. With regret we inform you that the death has occurred of our Friend and Colleague Frank O’Brien, Electric Ireland, Swift Square and formerly of ESB, Chapel Street Dundalk and ESB Monaghan. With regret we inform you that death has occurred of John Kirby (ex Garage, Dundalk) and father of Ann McMahon, ex Retail and Customer Supply Dundalk. Late of the ESB. Peacefully surrounded by his loving family in the compassionate care of the staff at Castleross Nursing Home. Predeceased by his parents Michael and Elizabeth, sister Monica and brother-in-law Ben Clarke. Loving husband of Mary nee Hoey and much loved father of Ann Mc Mahon, Yvonne Finegan, Geraldine Mc Coy, Patricia Prenty and Marie Kirby. John will be sadly missed and remembered with love by his wife, daughters, sons-in-law Padraig, Michael, Paul, Donal and Gerry, his cherished grandchildren Seán, Niamh, Áine, Mikaela, Aoife, Eoin, Liam, Ronan, Kate, Claire, Evan and Nathan, brothers-in-law, nieces, nephews, extended family, neighbours and friends. With regret we inform you of the death of our colleague PJ (Patrick) Coss, Moorefield Park, Newbridge and late of ESB Newbridge. Reposing at Anderson & Leahy’s Funeral Home, Newbridge on Wednesday from 3pm with prayers at 8pm. 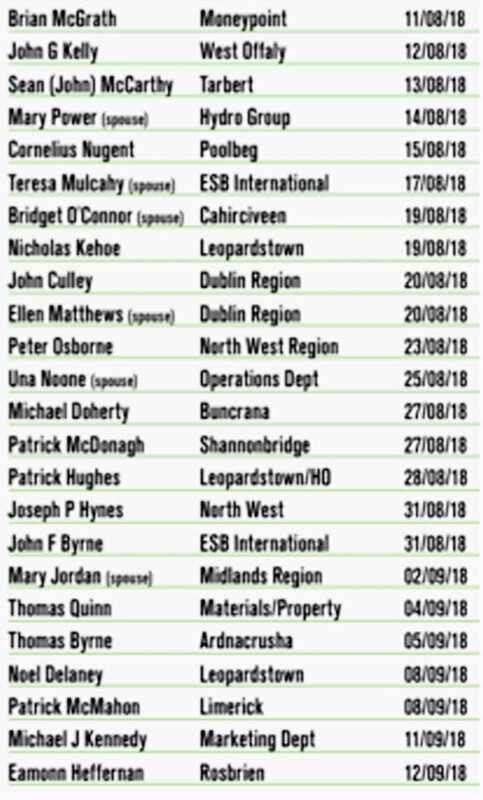 Removal on Thursday morning at 10:30am to arrive at St. Conleth’s Parish Church, Newbridge for 11am Mass with burial afterwards in St. Conleths Cemetery, Newbridge. Wife of the late Bill, Portlaoise Area Office. Church on Sunday to arrive for 12:30 PM Requiem Mass. Interment afterwards in SS Peter and Paul’s Cemetery. With regret we inform you of the sudden death of Willie Murphy retired staff member of Clonmel. The funeral will take in Portugal on Thursday evening April 14th. with funeral service and burial on Friday afternoon in Alvor Portugal. May he rest in peace. 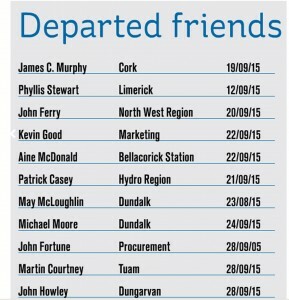 With regret we inform you of the death of our colleague Michael Killeen, retired Salesman Portlaoise. Funeral Arrangements as follows: Reposing in the Chapel of Rest at the Regional Hospital Portlaoise, from 2pm to 4pm on Sunday 10th April, 2016, with removal at 4pm to SS Peter and Paul’s Church, Portlaoise arriving at 4:30pm. Requiem Mass on Monday at 2pm and interment afterwards in SS Peter and Paul’s Cemetery. With regret we inform you of the death of our dear friend and colleague Terry Healy retired storekeeper Tralee Stores. Funeral arrangements as follows: Reposing at McElligotts Funeral Home Boherbuee Tralee from 3.30pm to 5.30pm Sunday 10th April and removal to St Brendans Church. Funeral mass at 11.00am on Monday 11 April. Deeply regretted by his sons Terry, Kevin and Michael and his daughters Anne-Marie and Grace. May he rest in peace. With regret we inform you that the death has occurred of Pat Maleady (Capdoo, Clane, Co. Kildare and Ex. E.S.B.) March 11th. 2016, (peacefully), at St. Vincent’s Private Hospital, Dublin. Pat, beloved husband of Ann and dear father of Alan, Colin, Suzie and Tracy. Pre-deceased by his brother Sean and his grandson Josh. 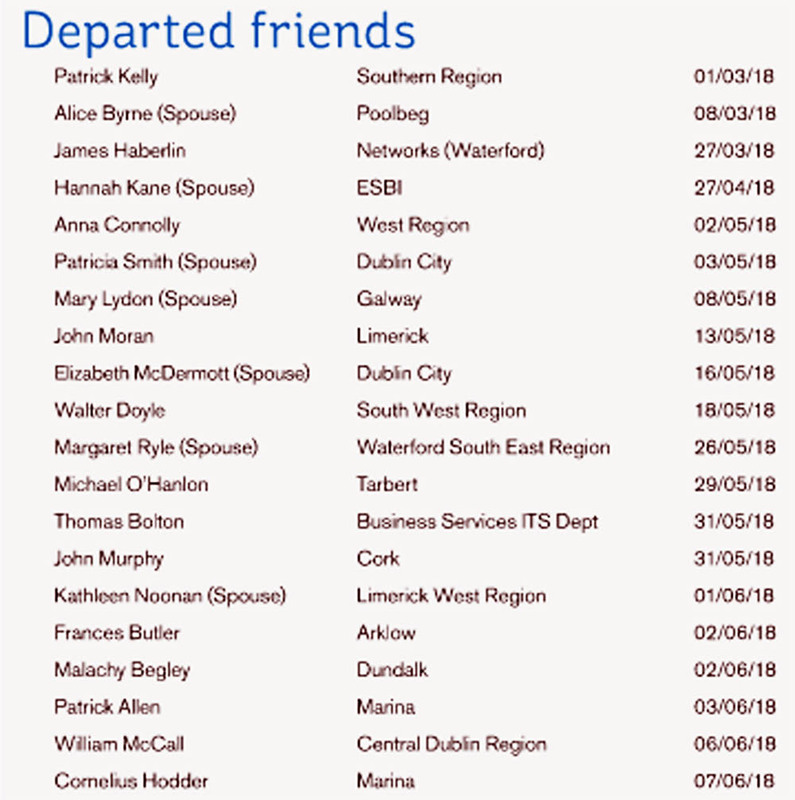 Sadly missed by his loving wife, sons, daughters, sons-in-law David and Seán, daughters-in-law Leanore and Ciara, grandchildren Sophie, Jamie, Isabelle, Jessie, Abigail, Ava, Daniel, Jack, Ruby and Danny, brothers Tom and Joe, sisters Marian, Rose and Martina, brothers-in-law, sisters-in-law, nephews, nieces, relatives and friends. Reposing at his residence on Sunday afternoon from 3pm until 7pm. (Family only on Saturday please). Removal to the Church of St. Patrick and St. Brigid, Clane on Monday morning, arriving for Requiem Mass at 12 noon followed by burial in Mainham Cemetery. With regret we inform you that the death has occurred of Denis O’Mahony, formerly of D&CS Tralee. Reposing at The Gleasure Funeral Home Tralee on Wednesday 2nd March, from 4.15pm to 6.15pm. Removal at 6.15pm to Our Lady & St. Brendan’s Church. Requiem Mass on Thursday at 12 noon. Interment afterwards in New Rath Cemetery. 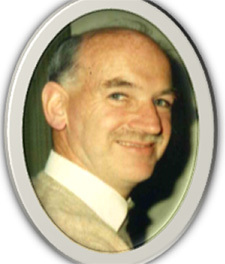 Quinn, Michael – Feb. 14, 2016, (Glasnevin and late of Ballycoolin) (Peacefully at home) beloved husband of the late Maureen; sadly missed by his loving sisters, brothers-in-law, nieces, nephews, relatives, neighbours and friends. Reposing in Jennings Funeral Home, Oscar Traynor Road, Coolock on Thursday, 18th February, from 10am, with removal on Thursday to Our Mother of Divine Grace, Church, Ballygall Road East arriving for 5.30pm. 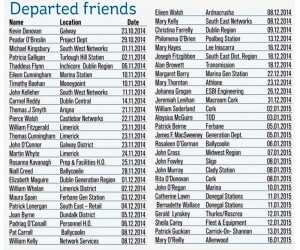 Funeral Mass on Friday morning at 10am followed by burial in Glasnevin Cemetery. Beloved husband of Stella and husband of the late Maureen and loving father of John, Bernard, Ciara (Lacey), Linda (O’Doherty) & Deirdre (Fogarty). Very sadly missed and dearly loved by his family step-children Tom, Ray & Niamh, his 13 wonderful grandchildren, sons-in-law, daughters-in-law, brothers Paul, Brendan, Vincent, Gregory and Gerard and the late Teddy & Donie, sisters Josephine, Una, Eileen and Bridie, brothers-in-law, sisters-in-law, nephews & nieces, relatives, neighbours and many friends and his former colleagues in the ESB. Reposing at O’Shea’s Funeral Home, Killarney on Friday evening from 4.30 pm to 6.30 pm. Removal at 6.30 pm on Friday evening to St Mary’s Cathedral. Requiem Mass on Saturday at 10.30am, burial afterwrds in Aghadoe Cemetery, Killarney. Family flowers only by request, donations if desired to Rockmount Care Centre, Kilgarvvan & Holy Cross Day Centre, Killarney. Reposing at Rigney’s Funeral Home, Athy from 5pm Thursday February 4th 2016 with Removal on Thursday evening at 7pm to arrive at St. Joseph’s Church, Ballyadams at 7.30pm. Requiem Mass on Friday at 11am. Burial afterwards in St. Joseph’s Cemetery, Ballyadams. With regret we inform you of the passing of Paul Keogh ex ESB Enquiry officer on Sunday 31st January 2016 in St James Hospital following a short illness. He was the beloved husband of the late Eileen and loving father of Fiona Dermot Paul & Cormac. 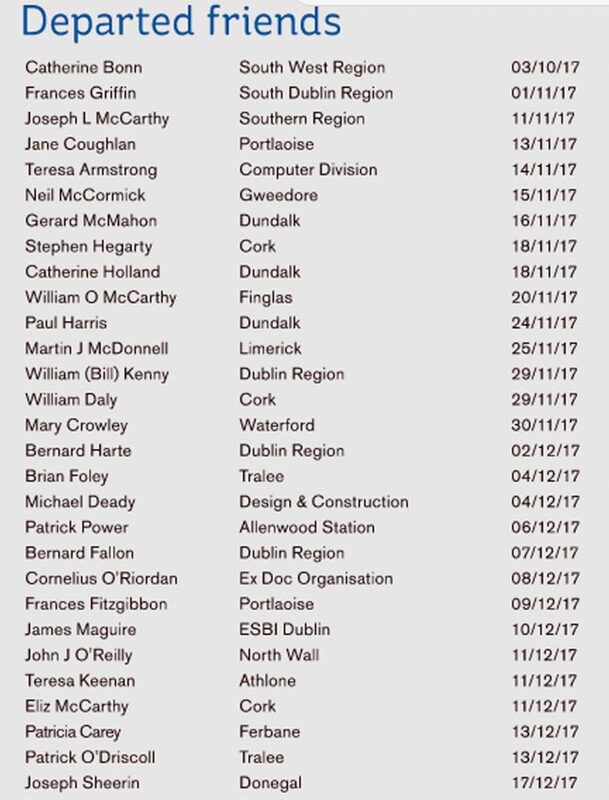 Sadly missed by his loving daughter, sons, son-in-law, daughters-in-law, 12 grandchildren, great grandchildren Leon & Eibhlin, sister Kathleen extended family neighbours and friends. Removal this Tues evening 2nd February, 2016 to the Church of Our Lady of Good Counsel Mourne road arriving at 5.30pm. Funeral tomorrow Wednesday after 10am Mass to Deansgrange Cemetry. Our thoughts and prayers are with Pauls family & friends at this sad time . With regret we inform you of the passing of Paul Richardson (Ex ESB Painter) father of our colleague Paul Richardson South Lotts Road. Reposing at his residence on Friday, 29th January, from 4pm to 8pm. Removal on Saturday to Our lady of Mercy, Church, Artane, arriving for 10.30am Funeral Mass followed with burial in Fingal Cemetery. Family flowers only please, donations, if desired, to St. Francis Hospice Raheny. Late of Killadreenan, Newtownmountkennedy. 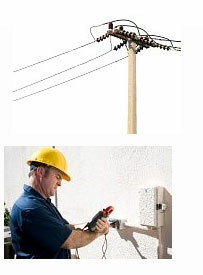 (Retired ESB). Peacefully at his residence in the loving care of his family. He will be sadly missed by his loving wife Ann, sons Joseph and Michéal, daughters Caroline, Annmarie and Rachel, sons in law Diarmuid and Tony, daughters in law Paula and Martina, brothers Dermot and Pudge, sister Mable, grandchildren Danielle, Sean, Matthew, Peter, Alex, Natasha, Rebecca and Malachy, great-grandchildren Mollie and James, nieces, nephews, relatives and friends. Reposing at Patrick Murray and Son’ Funeral Home, Main Street, Newtownmountkennedy, from 5pm until 7pm on Thursday 28th January with a prayer service taking place at 6pm. Removal on Friday morning to St. Joseph’s Church, Main Street, Newtownmountkennedy for Funeral Mass at 11am. Burial immediately afterwards in Kilmurray Cemetery. Family flowers only please but donations if desired to The Wicklow Hospice Foundation. Donation box at Church. With regret we inform you of the death of John (SEÁN) CRONIN (Cork and late of Clock House, Buttevant): On January 21, 2016, peacefully after a short illness at Cork University Hospital in his 93rd year, JOHN (SEÁN) (late E.S.B, Marina), Kiltegan Lawn, Rochestown and formerly of Well Road, Douglas, dearly loved husband of Kathleen (née O’Hare), loving father of Maeve, Emer, Aideen (Maher) and the late baby Oonagh and proud grandfather to Stephen, Rachel and Katie Cummings,Colm, Aisling and Aoife Supple and David Maher. Will be sadly missed by his wife, family, sister Anne (Hannah),sons-in-law Ger and Tom, sister-in-law Eilish, nephews, nieces and a supportive network of friends and neighbours. Reposing at his home on Sunday from 4pm until Rosary at 7pm. Reception prayers at 10.45am on Monday in St.Patrick’s Church, Rochestown followed by Requiem Mass at 11am. Funeral afterwards to St.Finbarr’s Cemetery. Family flowers only please. BYRDEN (Blackrock, Co. Dublin) Jan.13, 2016 (peacefully) in St. Vincent’s Hospital with his family at his side. James (Jim), beloved husband of Bridie, loving father of David, Kieran, Neil, Caroline and Lorraine; very sadly missed by his wife, children, sons-in-law, daughters-in-law, grandchildren, his sister Sheila, brothers Pat and Ken, extended family, neighbours and friends, particularly those who have been such a great support to Bridie. Reposing Monday in Quinn’s of Glasthule from 5-7pm. Removal Tuesday to Our Lady of Perpetual Succour Church, Foxrock, arriving at 9.50am for 10am Funeral Mass followed by burial in Deans Grange Cemetery. With regret we inform you that the death has occurred of our former colleague Joe Flynn, brother to retired colleague James Flynn formally CSS Killarney. Deeply regretted by his loving wife Breda, daughters Bernie and Joanne, mother Kitty, brothers Teddy, Pat, James and Gerard sister Kathleen and many relatives and friends.Funeral arrangements: Reposing at McElligott’s Funeral Home, Tralee on Friday evening from 4pm to 6.30pm followed by removal to Our Lady and St. Brendan’s parish church. Requiem mass will take place on Saturday at 11am followed by burial in New Rath Cemetery. Paddy Watters, Cloonaghbawn, Ballinfull, Co Sligo. At the Hazelwood Unit at St John’s Hospital, Sligo. Remains reposing at St John’s hospital chapel this evening from 5pm to 7pm. Removal at 7pm to the Church of Mary Immaculate, Grange, to arrive 7.30pm. Mass of the Resurrection on Friday at 12 noon with burial afterwards in Ahamlish Cemetery. 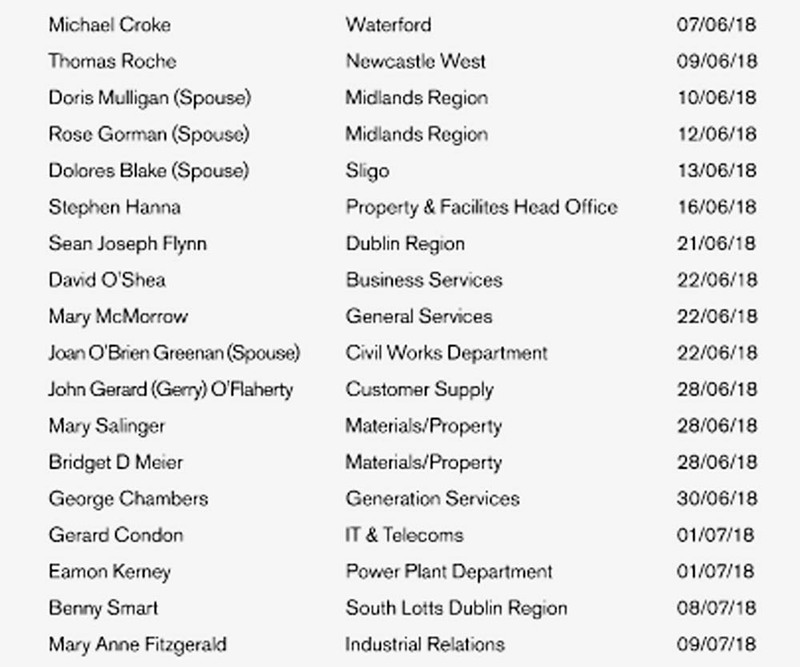 With regret we inform you that death has occurred of Kathleen Quinn, wife of PJ Quinn formerly Lanesboro Power Station. Reposing at her residence at Chapel Lane, Longford on Thursday 14th January until 9pm. Removal to St Mel’s Cathedral on Friday morning for Requiem Mass at 12. Our thoughts and prayers are with PJ and the Quinn family at this sad time. (Retired E.S.B.) Predeceased by his beloved sons Andrew and Francis. 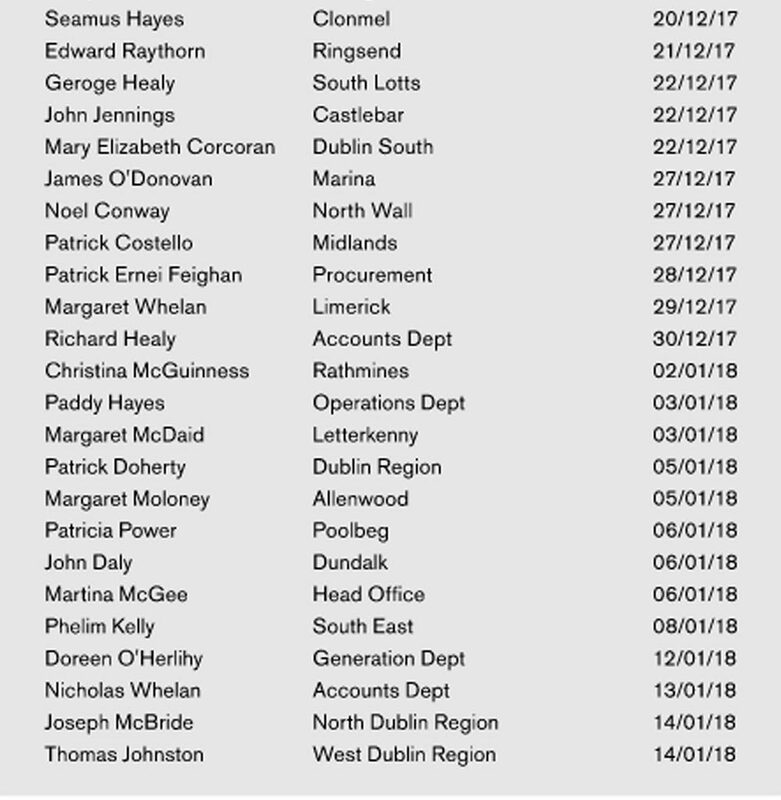 Sadly missed by his loving wife Breda, sisters-in-law Eilish and Mary, brothers-in-law Paddy and John, nephews, nieces, cousins, neighbours, relatives and many friends. Reposing at his residence on Thursday evening from 2pm until 6pm. (House private from 6pm please). Removal to the Church of Our lady Queen of Peace, Coosan arriving at 7.30pm. Requiem Mass on Friday at 12 noon with burial afterwards in Cornamagh Cemetery. With regret we inform you of the passing of our ex Turlough Hill colleague Geraldine Deay (nee Brady), Spratstown Bridge, Ballitore, Kildare. Funeral arrangements as follows: Reposing at her home from 12 Noon today Monday, 11th January, 2016 with prayers at 7.30pm. Removal Tuesday morning, 12th January, to Crookstown Parish Church for 11.00am Requiem Mass. Burial afterwards in adjoining cemetery. We extend our deepest sympathy to her husband Seamus, Son Conor, Daughter Niamh, Dad (Mick Brady) and Brother, Michael, extended family and friends. May she rest in peace. With regret we inform you of the death of our former colleague Mary Ferris. Formerly of Head Office and Leixlip. Funeral arrangements as follows: Reposing at William Ryan & Sons, Church St., Kilcock on Friday 8th January from 3.30pm followed by removal at 5.30pm to St Coca’s Church, Kilcock, arriving at 6pm. Funeral Mass on Saturday at 11am followed by burial in St. Joseph’s Cemetery, Kilcock. With regret we inform you of the death of Anne Walsh wife of Willy Bridgeman, formally Operations, Asset Management. 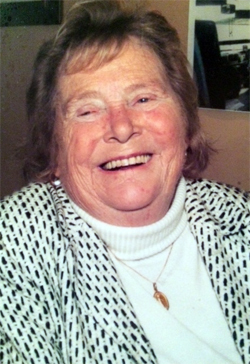 Reposing at her home on Monday evening (4th January) from 5.00 – 8.00pm. Removal on Tuesday morning (5th January) to the Church of the Holy Rosary, LaTouche Road, Greystones, arriving for 12.00 noon Requiem Mass followed by burial in Redford Cemetery. Family flowers only please. Donations, if desired, to the Peter McVerry Trust can be made at the church. 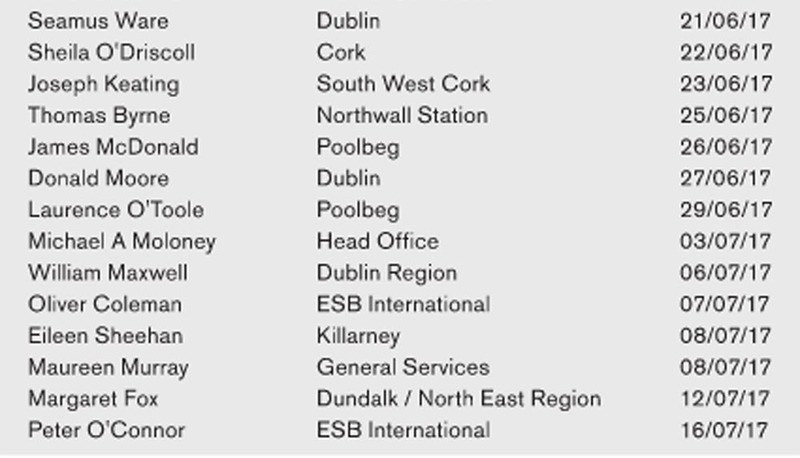 With regret we inform you of the death of Arthur Whelan late of Portlaoise Staff ESB. Peacefully in the loving care of the staff of St Vincent’s Hospital Mountmellick. Predeceased by his loving wife Bridie. Sadly missed by his loving family, sons Eamonn,Anthony, daughters, Mary, Julie and Geraldine, sons-in-law, daughters-in-law, beloved grandchildren, nieces, nephews, extended family, relatives and friends. Reposing at his home from 6pm today, Monday, 4th January 2016 with rosary recital this evening at 9pm. 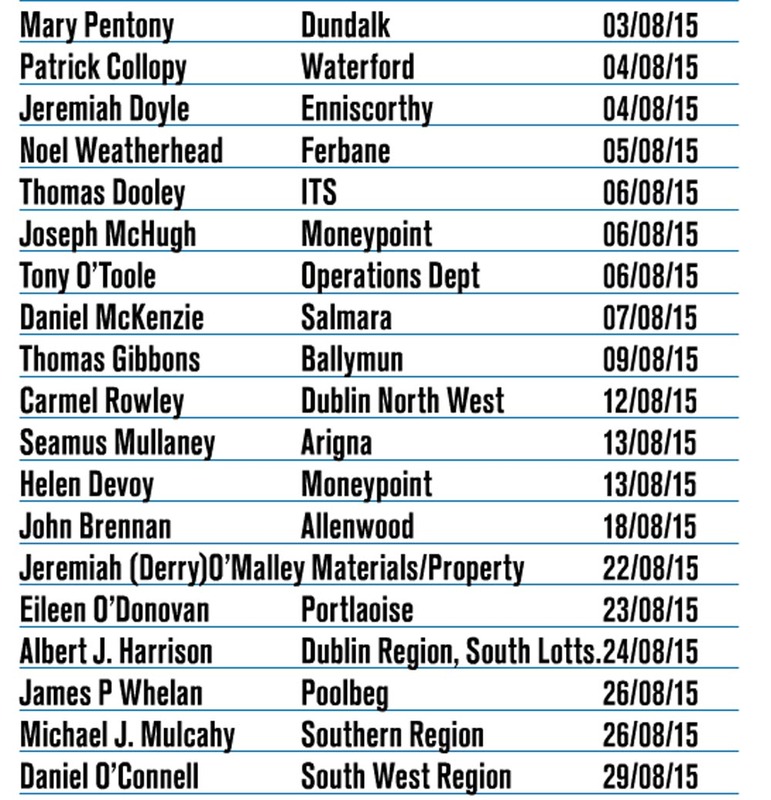 Removal on Tuesday at 5pm to arrive at SS Peter & Paul’s Church, Portlaoise for 6pm. Requiem Mass on Wednesday at 10am. Interment afterwards in SS Peter & Paul’s Cemetery. Family flowers only please. Formerly of Murneen, Claremorris, Co. Mayo. Peacefully at home, surrounded by her loving family. Sadly missed by her loving husband Richard, daughters Bairbre, Deirdre and Mairéad, son Ciaran, sister Margaret, son-in-law Mark, granddaughter Ava, sisters-in-law, brothers-in-law, nieces, nephews, relatives and friends. Reposing at her home on Sunday from 4pm with prayers at 7pm. Removal on Monday morning at 9.20am to arrive at the Church of Our Lady and St. David, Naas for Funeral Mass at 10am followed by Burial in St. Corban’s Cemetery, Naas. Family flowers only please. 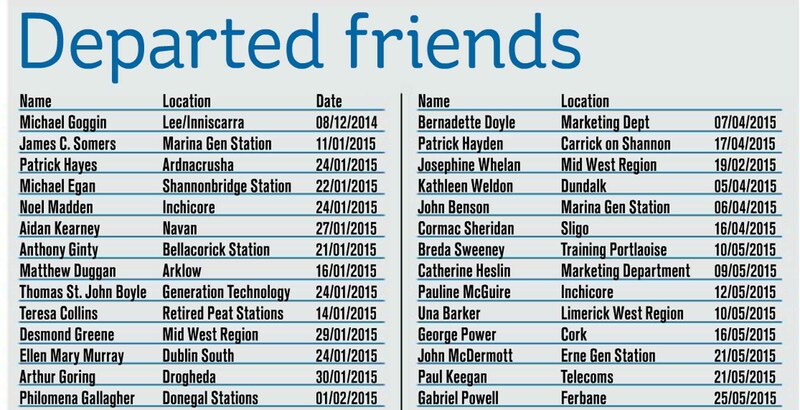 Donations, if desired, to The Friends of St. Brigid’s Hospice. With regret we inform you of the death of Desmond (Des) TOOMEY, (Late of Howth & Sutton, Co. Dublin and formerly of The Treaty Bar, Limerick and the E.S.B) 17th December 2015 (peacefully) in Beaumont Hospital. 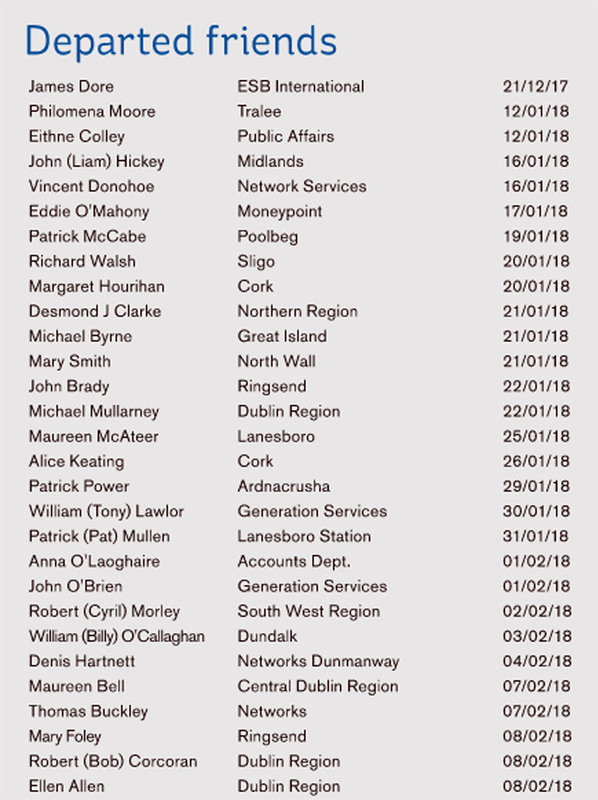 Des will be very sadly missed by his loving wife Patricia (Pat), children Patrick (Camphill), Andrew, Elaine, Cliona, Des, Annmarie, daughters-in-law Ruth and Sarah, son-in-law Eric, grandchildren Alex, Caitlin, Yannick, Abi, Loic, Aoife and Ellyn, his sisters Áine and Helen, extended family and many friends including those in Sutton Golf Club. Reposing Friday afternoon, in Stafford`s Funeral Home, Strand Road, Portmarnock from 3pm until his removal to the Church of The Assumption, Howth arriving for 5.30pm. Funeral Mass on Saturday morning 19th December 2015 at 10am followed by cremation in Glasnevin Crematorium. Family flowers only please – Donations, if desired, to The Society of Saint Vincent de Paul. 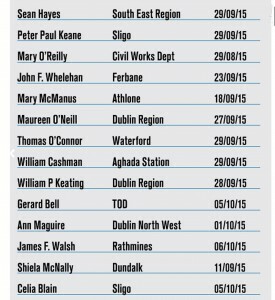 With regret we inform you of the death of Dermot Murphy Glasnevin. Formerly of ESB and ESB Swimming Club, 13th December 2015, Peacefully in the care of the Staff in the Mater Hospital – St Johns Ward surrounded by his family Dermot.Beloved husband to Rita and dear father to Brendan, Paul and Barbara. Sadly missed by his loving wife and family, grandchildren, daughters-in-law, brother Gerard, sisters-in-law, nephews, nieces, relatives and friends. Removal from The Kirwan Funeral Home, Ballygall Road West on Tuesday Evening to the Church of Our Lady of Victories, Ballymun Road arriving at 5.30pm. Funeral on Wednesday morning after 10am Requiem Mass to Glasnevin Crematorium. Family flowers only please. 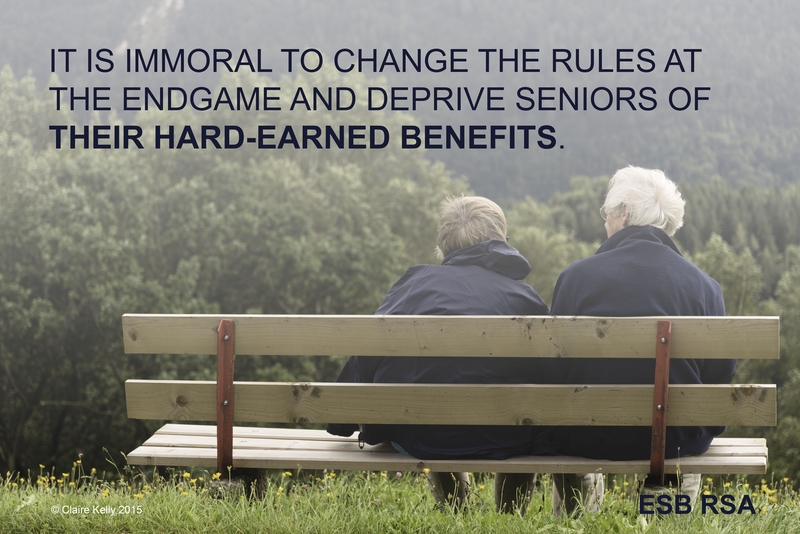 (Retired E.S.B.) Sadly missed by his loving wife, Lana, sons, Padraig and Paul, daughters, Mary O’Reilly, Helen and Leigh, his sister, Theresa, sister-in-law, Molly, son-in-law, Ray, daughters-in-law, Marise and Emma, grandchildren, nephews and nieces, relatives and friends. Reposing at his daughters residence, (Mary O’Reilly, 19 Beech Park) this Friday evening from 3pm until 8pm. Requiem Mass on Saturday at 12 noon in St.Mary’s Church with burial afterwards in Coosan Cemetery. Family flowers only please. 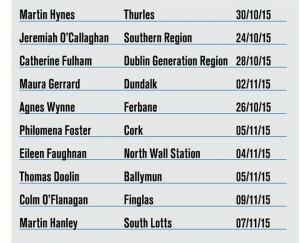 Donations, if desired, to The Irish Cancer Society. House private on Saturday, Please. 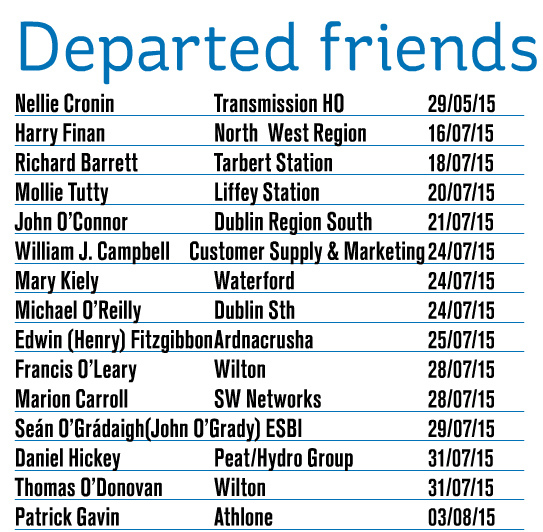 With regret we inform you of the death of Jerry Murray (Ex ESB Transmission Dept. and TOD) at Newtownpark House Nursing Home (peacefully) in his 91st year Thursday 26th November 2015. Removal on Monday evening (November 30th) to the Church of St. Thérèse, Mount Merrion due 6pm. Funeral Mass on Tuesday morning (December 1st) at 10am followed by burial in Mount Venus Cemetery. With regret we inform you of the death of George SOMMERVILLE (Blackrock, Co. Dublin, formerly of E.S.B), November 18, 2015 (peacefully) in the Blackrock Clinic, George, beloved husband of Verna, loving father of David, Jean, Jill and Paul. Very sadly missed by his wife, children, daughters-in-law, sons-in-law, grandchildren, his brother Charlie, extended family, neighbours and friends.Removal Saturday November 21st. from Quinn’s of Glasthule to the Church of the Guardian Angels, Newtownpark Avenue, Blackrock arriving at 9.50am for 10am Funeral Mass followed by cremation in Mount Jerome Crematorium. No flowers please. It is with regret that we inform you of the sudden death of Martin Hanley ex Leopardstown Road while on holidays overseas. Reposing at his home in Rathfarnham from 3.00 p.m. Friday 20th Followed by a Memorial Celebration of Martin’s life featuring traditional music and poetry.All friends and ex colleagues are very welcome to attend. Memorial Service in Mount Jerome Crematorium at 2.00 p.m. on Saturday 21st. Our thoughts and prayers are with his family at this sad and difficult time. May he rest in peace. With regret we inform you of the death of Sinead Martin only daughter of Tom Martin retired CSM Midlands West and Teresa Martin. May she rest in peace. With regret we inform you that the death has occurred of colleague and former staff member Andy Wilson. Andy is remembered for his huge contribution in driving safety standards on some of ESB’s largest construction projects such as Coolkeeragh, Moneypoint’s Environmental Retrofit Project and Marchwood Power Station in Southampton, UK. With regret we inform you that the death has occurred of Martin (Murt) Hynes, retired staff ESB Thurles/Tipperary on Friday 30th. October, 2015. Reposing at Doyles Funeral Home, Roscrea on Tuesday from 5pm with removal at 8pm to arrive at Ballybritt Church at 8.30pm. Funeral Mass on Wednesday 4th. November at 11am followed by burial in Dungar Cemetery. May he rest in peace. With regret we inform you of the death of John Gerard (Gerry) Goss (Blackrock Co.Dublin and late of ESB) October 22nd 2015. Peacefully, at home, beloved husband of the late Bridie and loving father of Anne (Brennan), Gerry and Marie (Muldowney). Sadly missed by his loving son and daughters, daughter in-law, sons in-law, grandchildren, greatgrandchildren, nieces and nephews, extended family, carers and friends. Removal on Monday morning from his residence to Church of the Guardian Angels, Newtownpark Ave., arriving for 10am Funeral Mass, followed by cremation at Mount Jerome, Harolds Cross. With regret we inform you of the death on Friday 16th October 2015 of our former colleague Dermot Kearns ex ESB National Grid. Funeral arrangements are; Funeral Mass Thursday 22nd at 10am at the Church of the Assumption of the Blessed Virgin Mary, Walkinstown, followed by burial at Newlands Cross Cemetery. Our thoughts and prayers are with his family and friends at this sad time. We regret to inform you of the death of our friend and former colleague George Walsh, Chemical Division, Genertion on Thursday 15th. October 2015. Our thoughts and prayers are with his family and friends at this sad time. May he rest in peace. Removal on Saturday morning (17 October) to the Church of St. Colmcille, Knocklyon arriving for Funeral Mass at 10am and afterwards to Kilmashogue Cemetery, Rathfarnham. Donations, in lieu of flowers, to Our Lady’s Hospice, Harold’s Cross. The death has occurred of Kathleen McGetrick, (nee Dorrian) Renvyle, Cornageeha, Sligo at Sligo Regional Hospital- wife of John McGetrick Ex Stations Supr., Sligo Funeral arrangements as follows;. Requiem mass in St John’s Church Carraroe, at 11.00am on Tuesday 13th October 2015 with burial afterwards in Sligo cemetery. House private on Tuesday morning please. Family flowers only. Our Thoughts & Prayers are with John & his Family at this sad time. May she Rest in Peace. With regret we inform you that the death has occurred of Peter Ryan ex ESB. Peacefully at The Bon Secours Hospital, Glasnevin, and late of E.S.B. Beloved husband of Sheila and dear father of Alan, Valerie and Karen. Sadly missed by his loving wife, son, daughters, sisters, daughter-in-law, sons-in-law, his eight grandchildren and five great-grandchildren, brothers-in-law, sisters-in-law, extended family and friends. Reposing at his home on Wednesday evening from 6pm until 8pm. Humanist Service on Thursday afternoon 8th. 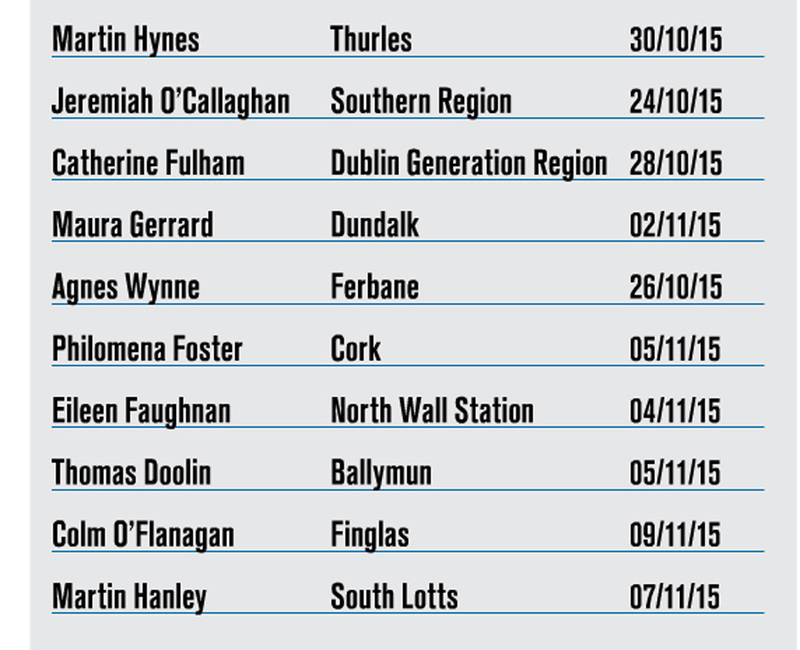 October, 2015 at 2.30pm in Glasnevin Crematorium Chapel. Family flowers only please. WALSH (Killiney, Co. Dublin and formerly of Feenagh, Co. Limerick) – October 6th 2015 (peacefully) at St Vincent’s Private Hospital. James (Jim) (late of E.S.B. ); dearly beloved husband of Mary much loved father of David and Nevill. Sadly missed by his loving wife, sons, daughters-in-law Michelle and Angela, grandchildren Conor, Rhian, Eimear and Grace, brother Robert, sister Bridget (Delia), extended family and friends. Funeral Requiem Mass on Friday morning at 10am at the Church of Our Lady of Good Counsel, Churchview Road, Killiney followed by burial immediately afterwards at Shanganagh Cemetery, Shankill. No flowers please. Donations, if desired, to Blackrock Hospice, the Irish Cancer Society or a Charity of Choice. House private. We regret to inform you that death has occurred of Sean Hayes former Engineering Officer Portlaoise, and of Croosroads Killaloe, Co. Clare. Formally of Gurtmagee, Killaloe and Durrow Co. Laois. Deeply regretted by his brother Austin, sister Sr. Kathleen, sister in law, brother in law, nieces, grandnieces, grandnephews, relatives and his many friends. Reposing this Wednesday evening the 30th at 6pm in Lynch’s Funeral Home Killaloe. Removal to St. Flannan’s Church Killaloe at 7:30. Funeral Mass on Thursday the 1st at 11am, follwed by burial afterwards in Relig Lua. Hillside, Rostellan, Saleen, Cork / Aghada, Cork: ex ESB Generating Station Aghada. William Cashman (Hillside Rostellan and late of Saleen) on September 29th 2015 peacefully at home. Beloved husband of Peg, loving father of Lisa and Shane, loving granddad of Shauna, Ciarán, Cormac, Evan and Noah. Sadly missed also by his sister Lily, son-in-law Pat, daughter-in-law Fiona, brothers-in-law, nephews, relatives, neighbours and friends. Reposing at Hyde’s Funeral Home, Drury’s Avenue, Midleton on Thursday from 6pm until removal at 7.30pm to St. Erasmus Church Aghada. Requiem Mass on Friday at 12 noon. Burial in All Saints Cemetery. With regret we inform you of that death has occurred of John (Johnny) Howley RIP Portnahully, Carrigeen, Co. Kilkenny & formerly of ESB Waterford. Johnny passed away (peacefully) at home on Sept. 28th, 2015, surrounded by his loving family. Beloved husband of Mary and loving father of Alice, Richard and JoAnn; Grandson Sam, Brothers, Sisters, extended family & Friends. Following Requiem Mass at the Church of the Assumption, Mooncoin, Johnny was laid to rest in the adjoining cemetery. Courtney Martin (Mannie) Parkview, Drive, Tuam, Co Galway September 28, 2015. Reposing at Glynn’s Funeral Home, High St, Tuam this Tuesday from 6pm. Removal at 8pm to The Cathedral of the Assumption Tuam. Funeral Mass Wednesday at 11 am followed by burial in Tuam Cemetery. 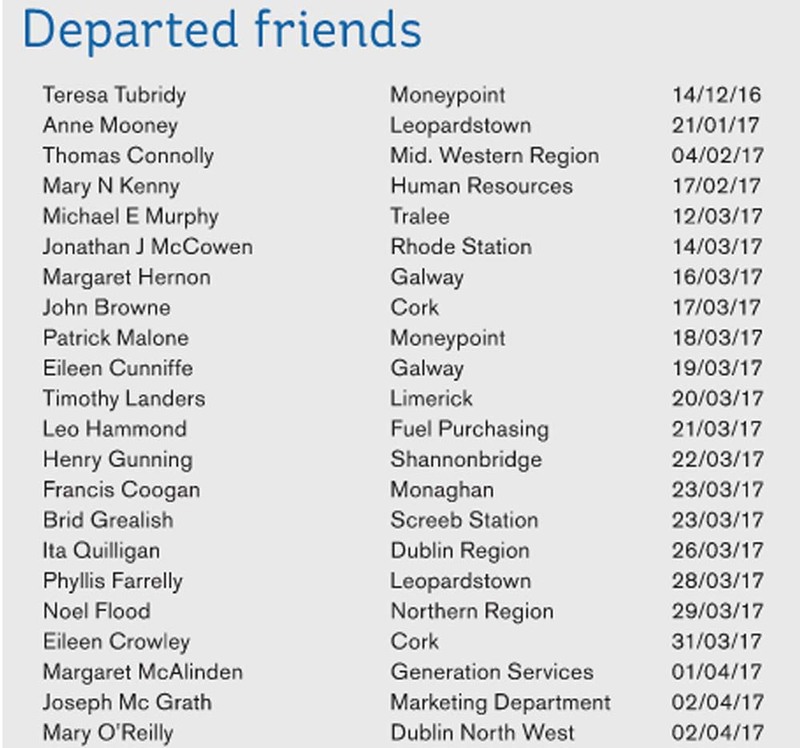 With regret we inform you that he death has occurred of our friend & former colleague Tommy Droley, Ex Operations, Ardnacrusha Station. Funeral details: 5-7:30pm this evening (Monday 14th September, 2015) at Dalys Funeral Home, Francis St. Ennis with removal to Barefield Church. Mass on Tuesday morning @ 11am and a celebration of Tommy’s life afterwards in the Auburn Lodge Hotel. Our thoughts & prayers are with the Droney Family at this sad time.May his gentle soul rest in peace. 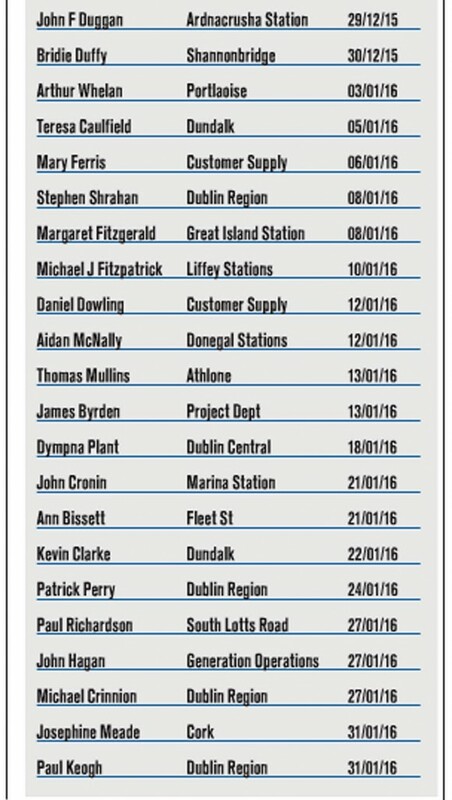 With regret we inform you of the death of Michael Ryan ex ESB transmission Dept. Funeral at Church of the Guardian Angels, Newtownpark Avenue, Wednesday 16th September, 2015, arriving at 9.50am for 10am Funeral Mass, followed by cremation in Mount Jerome Crematorium, Harold’s Cross, D6W. No flowers please, donations if desired to the Irish Cancer Society. With regret we inform you of the death of our former colleague & friend Des Hennell. He passed away peacefully in the loving care of his family on Saturday 5th September 2015. He will be reposing at Floods Funeral Parlor from 15.00 – 20.00 todayFuneral arrangements :-The funeral will take place tomorrow, Tues. 8th Sept. @ 12.00 in St. Michael’s Church, St. Michael’s Road, Gorey.May he rest in Peace. With regret we inform you that the death has occurred of Dan O’Connell formerly of ESB & father of Tony O’Connell ESB Wilton Cork / Ballyvolane, Cork On August 29th 2015, peacefully after a short illness at the Cork University Hospital. With regret we inform you of the death of our former colleague, Derry O’Malley, ex. Estates Management, Head Office following a short illness. Funeral arrangements are as follows. Reposing at his residence today (Monday) from 5 pm – 8 pm. Removal tomorrow (Tuesday) to Corpus Christi Church, Home Farm Road, arriving for 10 o’clock funeral mass followed by burial in St. Fintan’s Cemetery, Sutton. 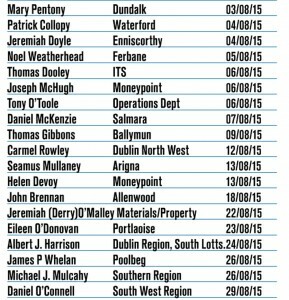 Death of Tony O Toole, ex Transmission Dept, Head Office. 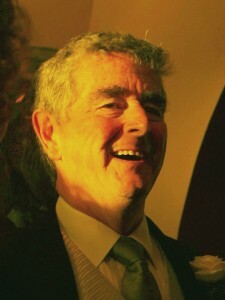 With regret we inform you of the sudden death of Tony O Toole, Ex Transmission Dept, Head Office, while on holiday in UK. Our thoughts go out to Tony’s wife, Ann and family, at this sad time. WITH REGRET WE INFORM YOU THAT THE DEATH HAS OCCURRED OF PATRICK GAVIN, RETIRED STAFF OF ESB NETWORKS ATHLONE.REPOSING AT HIS HOME ON TUESDAY FROM 2PM UNTIL 5PM ( HOUSE PRIVATE THEREAFTER ). REMOVAL TO CORPUS CHRISTI CHURCH, MOUNT TEMPLE, ARRIVING AT 7PM. FUNERAL MASS ON WEDNESDAY AT 11 AM, BURIAL AFTERWARDS IN DONEGAN CEMETERY. FAMILY FLOWERS ONLY DENATIONS IN LIEU TO SOUTH WESTMEATH HOSPICE.MAY HE REST IN PEACE. I heard on the only today that a colleague and former Chairman of RSA passed away some weeks ago. 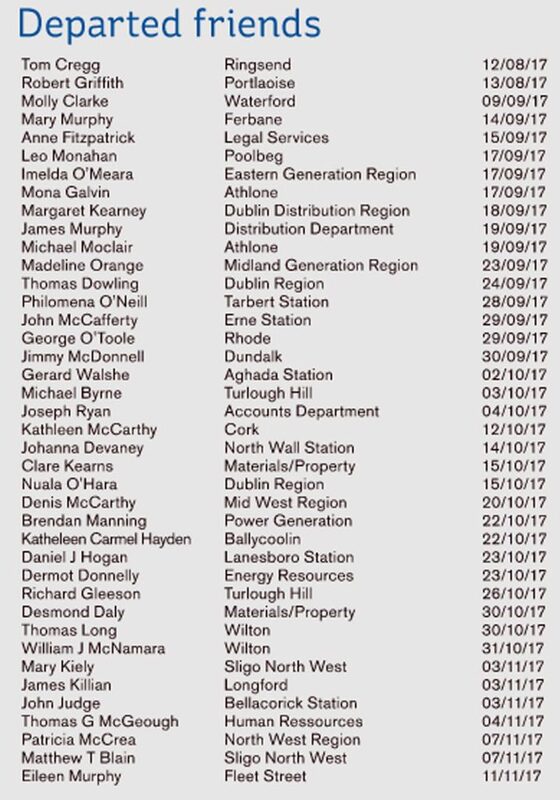 I’m speaking of Dan Hickey, Greystones, Limerick and member of Limerick branch. 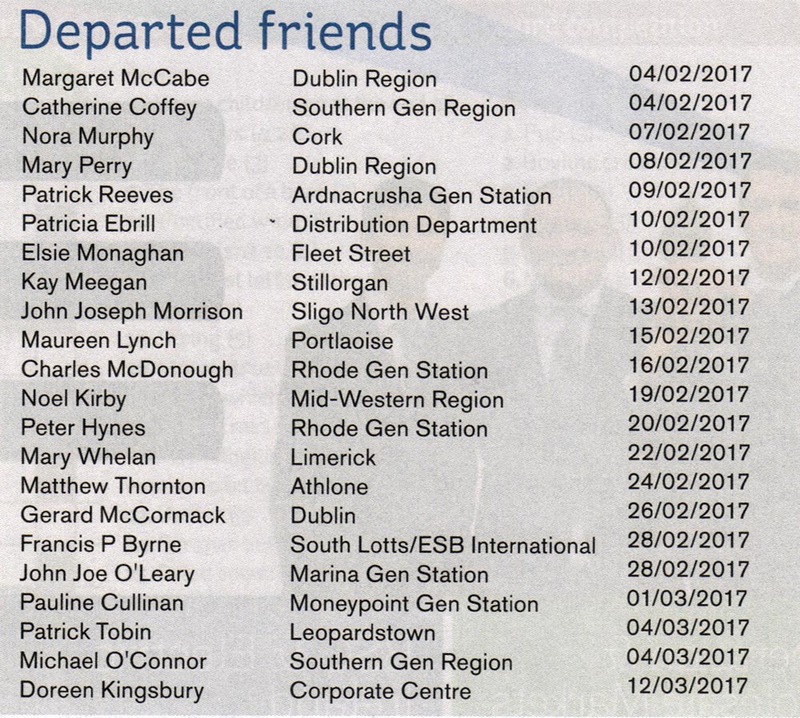 On behalf of the ESB Retired Staff Association I would like to offer my sincere regret at his passing to his wife Margaret and family. May he rest in peace. Ex ESB Transmission Dept and ESBI. Sadly missed by his loving wife Deirdre and Family. Reposing at his home from Saturday August 1st from 4pm. As we remember Derek on what would have been his 70th Birthday (1st July); Elizabeth, Aongus, David, Lisa, Lynn and their families would like to express our heartfelt thanks to all those who supported us after the loss of our beloved husband, father, papa & friend. Your Mass cards, letters and other expressions of sympathy have been a great comfort, even if we have not been able to acknowledge them all individually. We particularly thank those who called in while Derek reposed or who travelled long distances to attend the Funeral. We have been deeply moved by just how special Derek was to all those who knew him and we have enjoyed hearing your fond memories and stories of him. 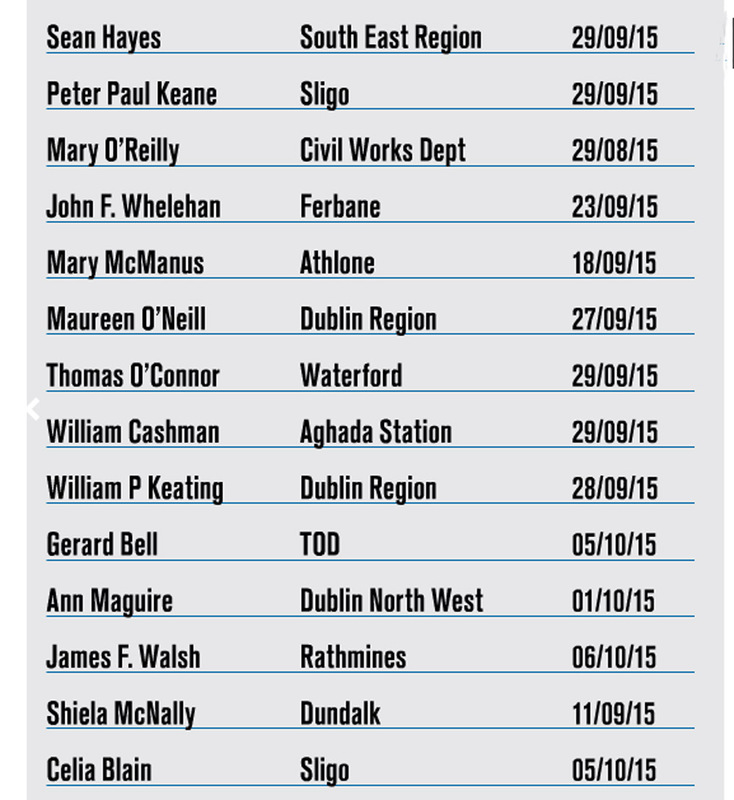 Derek’s Month Mind will be held on Saturday August 1st in Our Lady of Good Counsel Church, Johnstown- Killiney at 7pm. On Friday 19th June 2015, Late of the E.S.B. Reposing at Cooney’s Funeral home New Ross on Friday 19th June from 4pm until 9pm. Removal from the funeral home on Saturday 20th June at 11.50am to St.Mary & Michael’s Church New Ross, for Funeral mass at 12 noon. Burial afterwards in St. Stephen’s Cemetery, New Ross. With regret we inform you of the death of Brendan Byrne, (late of ESB.) Cogran, Lusmagh, Banagher, Co. Offaly, Father of Ray, ESB Athlone. Removal on Wednesday morning to St. Cronan’s Church, Lusmagh arriving for Mass at 12 noon, burial afterwards in Kilmahunna Cemetery. Family flowers only please. 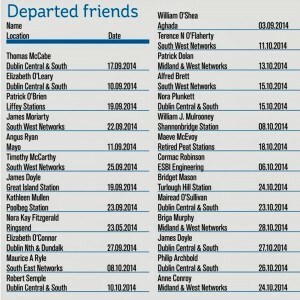 Donations if desired to Offaly Branch Alzheimers Assosiation May he rest in peace. 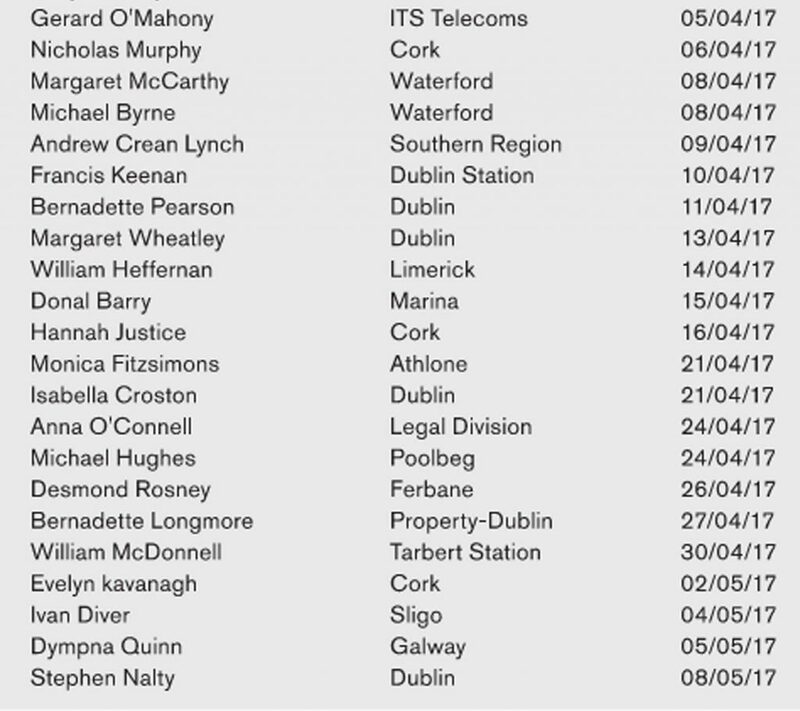 KEEGAN (Killiney, Co. Dublin) – May 21st 2015 suddenly but peacefully at St Vincent’s University Hospital. Paul Derek (late of E.S.B. ); dearly beloved husband of Elizabeth much loved father of Aongus, David, Lisa and Lynn. Sadly missed by his loving wife, sons, daughters, sons-in-law John and Brendan, daughters-in-law Sylvia and Siobhán, grandchildren Holly, Megan, Laura, Jack, Anna, Sophie, Shane, Sam and Eva, brothers, sisters, brothers-in-law, sisters-in-law, nephews, nieces, relatives and a large circle of friends. Rest In PeaceReposing at his home on Friday between 4p.m. and 8p.m.. Removal on Saturday morning to Our Lady of Victories Church, Sallynoggin arriving at 9.45am. Funeral immediately after 10am Requiem Mass to Deans Grange Cemetery. It is with regret we have learned of the death of Edward (Eddie) Walsh father of our former colleague Eamon Walsh and father-in-law of Margaret Hayden. Funeral arrangements as follows:-Reposing at Our Lady’s Hospice with prayers on Wednesday at 5.30pm. Funeral on Thursday after 11.30am Mass in Church of St. Paul of the Cross, Mount Argus to Newlands Cross Cemetery. Family flowers only please. Donations in lieu to Our Lady’s Hospice, Harold’s Cross.May He Rest in Peace. Reposing at Reilly’s Funeral Home, Leinster St., Maynooth, on Tuesday from 4pm-8pm, with rosary at 7pm. Removal from his residence on Wednesday morning at 9.30am to arrive at St. Mary’s Church, Maynooth, for 10am funeral Mass, followed by burial in Laraghbryan Cemetery. House strictly private on Wednesday morning please. Heslin Kitty (nee Conran), Newpark, Portlaoise. Died 9th May 2015. 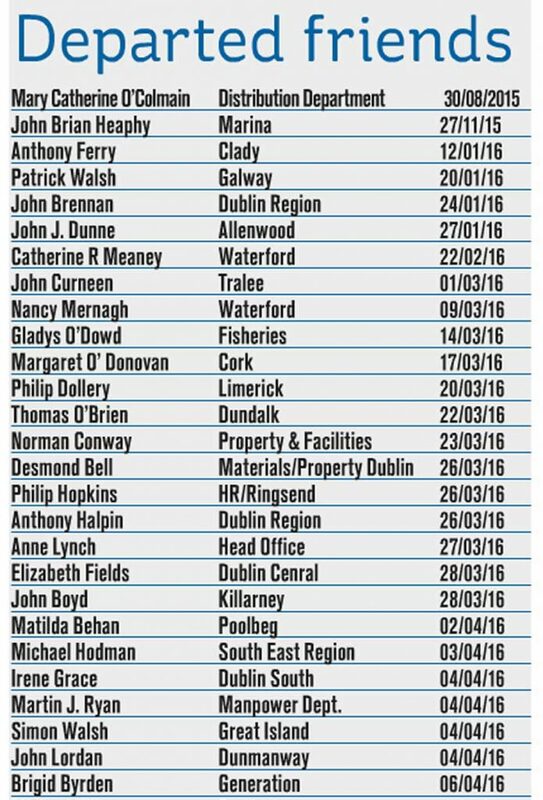 Wife of the late John, former District Manager Portlaoise. Reposing at her residence from 2pm on Monday, with removal at 6:30pm to SS Peter and Paul’s Church, Portlaoise to arrive at 7pm. Requiem Mass at 12 noon on Tuesday, followed by interment in SS Peter and Paul’s Cemetery. Family flowers only, donations, if desired to Concern for Nepal. It is with great sadness that we have learned of the death of our very dear friend and former colleague Antoinette Lenehan (ex N/T Longford).She will be reposing in Davy Connell’s Chapel Room, Church Street, Longford on Wednesday 6/5/15 from 6pm to 9pm.Mass on Thursday 7/5/15 in St. Bridget’s Church,Ardagh at 12noon.Burial afterwards in Moydow Cemetery.Our thoughts and prayers are with her husband Joseph and her family at this very sad and difficult time.May She Rest In Peace. The death has occurred of Margaret Moran, ‘Ashwood House’, Kinlough, Co. Leitrim peacefully after a short illness at Sligo General Hospital – mother of Michael Moran, Project Leader HV North, & former staff member in Networks Cranmore Rd., Sligo, Asset Management, Osprey House, & Stations Letterkenny. Funeral arrangements as follows; Remains reposing at her late residence from 4pm to 10pm on Fri. 1st May & from 12pm to 6pm on Sat. 2nd May. withremoval to St. Aidan’s Church, Kinlough arriving at 8pm.Funeral mass on Sunday 3rd May at 3pm with burial immediately afterwards. Our Thoughts & Prayers are with Michael & his Family at this sad time. May She Rest in Peace. 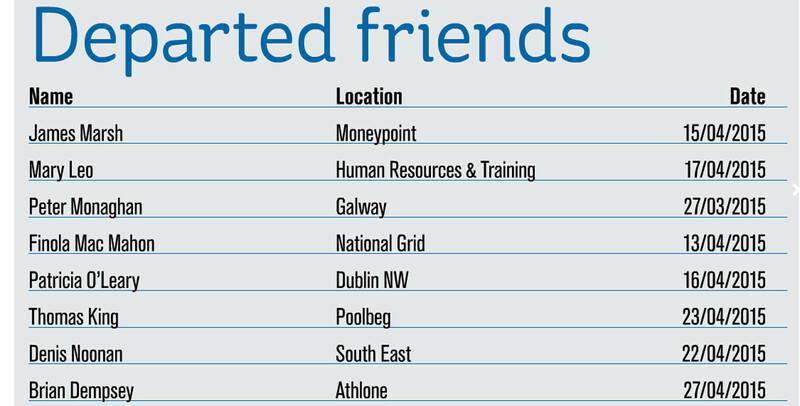 Barney was a retired member of the Transmission Lines staff in Athlone. 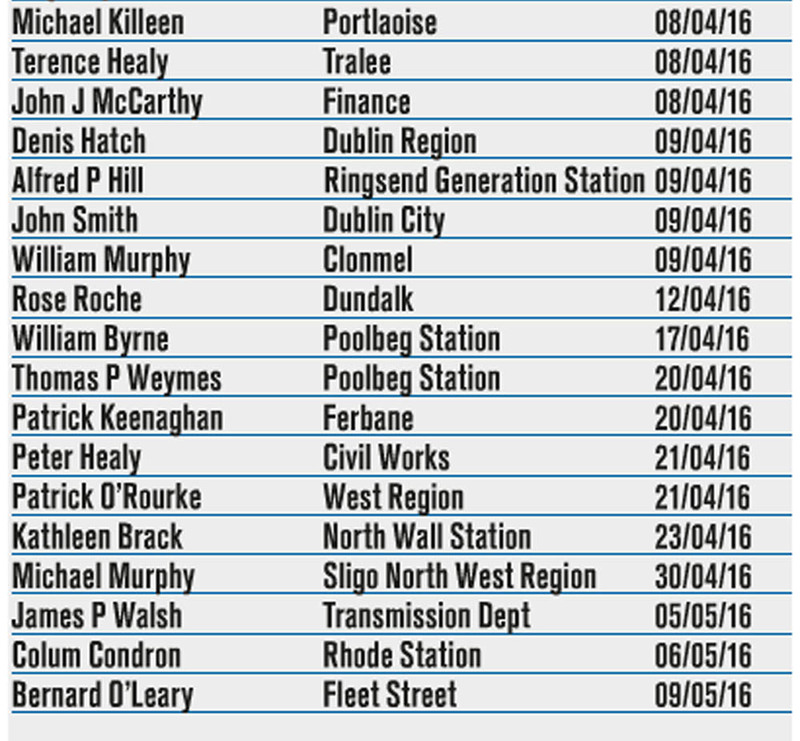 His Nephew, Brian, is also a retired member of the Transmission Lines staff in Athlone. Late of E.S.B., suddenly, at the Beacon Hospital. Dear sister of Bill and Michael. Deeply regretted by her brothers, sisters-in-law, brother-in-law and extended family. Removal on Tuesday to the Church of the Holy Name, Beechwood Avenue, arriving at 09.45am for 10am Funeral Mass followed by cremation in the Garden Chapel in Mount Jerome, Harold’s Cross. Family flowers only. Donations in lieu to the Samaritans. The death (peacefully)has occurred of our former colleague Jimmy Marsh at Carrigoran Nursing Home, Newmarket-on-Fergus.Reposing at Cusack’s Funeral Chapel, Kilrush, Co.Clare on Friday evening from 4 o’clock with removnal at 6 o’clock to St. Senan’s Church Kilrush. Funeral Service on Saturday 18th April, 2015 at 11 o’clock. Burial afterwards in All Saints Cemetery, Shanakyle, Kilrush.May he rest in peace. passed away peacefully Monday 13th April, 2015. Funeral Arrangements are as follows: Removal to St Joseph’s Church Terenure arriving at 5.30pm Wednesday 14th April. 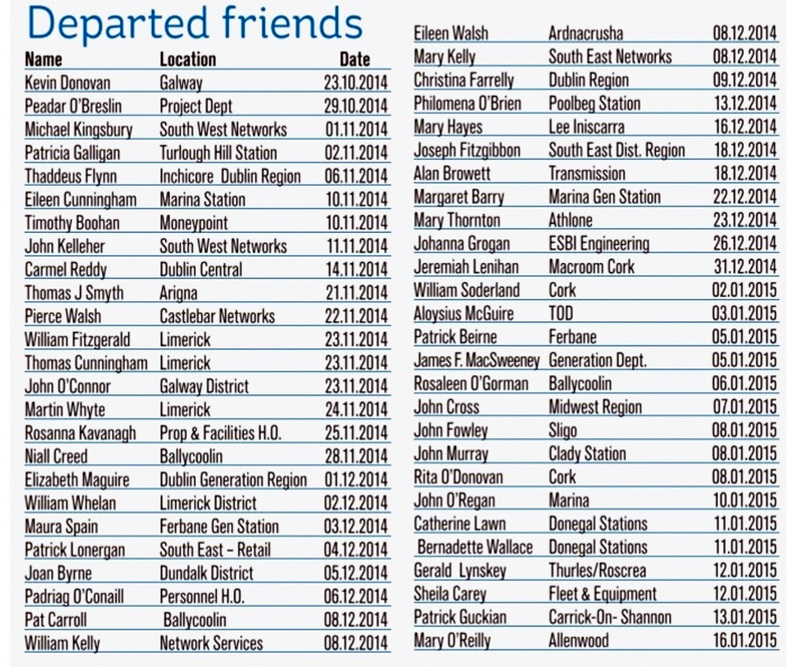 Funeral on Thursday, after 12 noon Mass, to Mount Jerome Cemetery. Family flowers only please, donations if desired to Our Lady’s Hospice, Harold’s Cross. Barry Dempsey died suddenly in U.S.A. on Friday 27th March 2015. Edward McNern and Danny McNern both brothers of Louis McNern, Ex Staff, Networks, Letterkenny. The death has occurred of Edward McNern and Danny McNern both brothers of Louis McNern, Ex Staff, Networks, Letterkenny. Both brothers died on 10th March in the UK. Edward died suddenly in his home & Daniel died in hospital after a short illness. Funeral arrangements for Edward McNern as follows; Edward McNern’s remains will be arriving at George Best City Airport, Belfast on Saturday morning 21st March @ 11.30 am & will then be taken to his late residence at Lignaul, Inver, Co. Donegal. Removal on Sun morning at 11.00 to arrive at Ardaghey Church for requiem mass at 11.30 am. Funeral arrangements for Danny McNern. The funeral of Danny McNern will take place in London on Friday 27th March.Our Thoughts & Prayers are with Louis & His Family at this very sad time for them all. May They Both Rest in Peace. on Thursday 19th March 2015.
on Sunday 8th March, 2015, RIP. on Saturday 28th. February, 2015, RIP. on Sunday 1st March, 2015, RIP. on 1st March, 2015, RIP. on Sunday1st March, 2015, RIP.